After Steve Bannon announced his tell-all book, President Donald Trump’s lawyers have written to his former strategist, saying he has violated a non-disclosure agreement. The cease-and-desist notice accuses Steve Bannon of defaming President Trump in speaking to author Michael Wolff. Michael Wolff’s forthcoming tell-all book describes Donald Trump as being unprepared for the president job. The 64-year-old writer is a former columnist for New York magazine and Vanity Fair. He also wrote a biography of media mogul Rupert Murdoch. His book is reportedly based on more than 200 interviews. President Trump responded by saying Steve Bannon had “lost his mind” after losing his White House position. The president’s lawyers said Steve Bannon had broken his employment agreement by speaking to Michael Wolff about Donald Trump and his family, “disclosing confidential information” and “making disparaging statements and in some cases outright defamatory statements to Mr. Wolff about Mr. Trump, his family members, and the Company”, the letter said. Fire and Fury: Inside the Trump White House makes many explosive claims, including that Steve Bannon thought a meeting between Donald Trump Jr. and a group of Russians was “treasonous”. The Trump team was shocked and horrified by his election win and Donald Trump’s wife, Melania, was in tears on election night. Donald Trump was angry that A-list stars had snubbed his inauguration and the new president “found the White House to be vexing and even a little scary”. The book also claims that Ivanka Trump had a plan with her husband, Jared Kushner, that she would be “the first woman president”. Ivanka Trump mocked her dad’s “comb-over” hairstyle and “often described the mechanics behind it to friends”. The book also alleges that former UK PM Tony Blair told Donald Trump during a meeting in February 2017 that the British intelligence services may have been spying on him and his campaign, according to a report in The Times. The Times says Tony Blair was hoping to get a job advising Donald Trump on the Middle East. A spokesperson for Tony Blair told The Times that the allegations were a “total fabrication: and said the former prime minister had not suggested himself as Donald Trump’s Middle East envoy. In March 2017, then-White House press secretary Sean Spicer told journalists UK intelligence services could have been involved in an alleged spying operation on Trump Tower in New York. GCHQ said the allegation was “nonsense”. According to New York magazine, which first published the extracts from Michael Wolff’s book, the author was able to take advantage of the Trump administration’s political inexperience to gain an unusual amount of insight. “There were no ground rules placed on his access, and he was required to make no promises about how he would report on what he witnessed,” it says. Michael Wolff said he was able to take up “something like a semi-permanent seat on a couch in the West Wing” following the president’s inauguration. In a statement on January 3, President Trump said: “Steve Bannon has nothing to do with me or my presidency. “Steve was a staffer who worked for me after I had already won the nomination by defeating seventeen candidates, often described as the most talented field ever assembled in the Republican party,” the president continued. White House press secretary Sarah Sanders described the book as “filled with false and misleading accounts from individuals who have no access or influence with the White House”. Steve Bannon, the president’s former chief strategist, was considered a key player in the Trump White House and helped shape Donald Trump’s “America First” campaign message before he left his post in August. In April, President Trump had declined to affirm that Steve Bannon still had his support, removing him from his elevated role on the crucial National Security Council. After leaving the White House, Steve Bannon returned to his role as the head of the right-wing Breitbart News website, where he said he planned to help the Trump administration as a “wingman outside”. 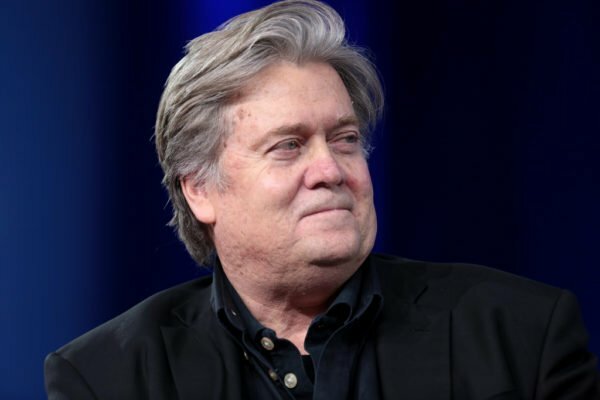 Donald Trump reportedly spoke to Steve Bannon as recently as December 13, the day of the special Senate election in Alabama that saw the defeat of Republican Roy Moore, whom Bannon supported.